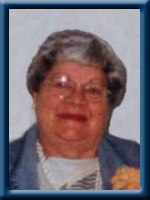 MANTHORNE – Vera Zina, 83, of Mill Village, Queens County, NS, passed away peacefully in North Queens Nursing Home, Caledonia on March 2nd, 2011. Born in Thessalon, Ont., she was a daughter of the late William Brandon. Formerly of Sudbury, Ont., Vera was a former bookkeeper for Roy’s TV and Furniture and a clerk with Woolco, Travel Trends and Edwards Hardware and Furniture. Vera enjoyed knitting occasionally, bowling, fishing and camping. Surviving are her husband Carl, daughters Sandra (Darryl) Bednis of Kitchener, Ont. and Darlene Whitfield of Kincardine, Ont. Grandchildren Jason Marsh of Kincardine, Ont. ; Dana (Mark) Schnittke and Stacey (Shayne) Sangster of Kitchener, Ont. Great grandchildren Coltin, Tarran, Quinton, Colten, Keira, Nicholas and Nolan. Sisters: Betty Washington of London, Ont. and Barbara (Ross) Evans of Hastings, Ont., brother Robert “Bobby” (Sister) of Blind River, Ont. So sorry to hear of your loss.Our condolences to you all at this time. now at peace, she was a lovely lady. I’m so sorry to hear about the passing of Aunt Vera. I am saddened to read of the death of Vera. I enjoyed visiting with her when I took my dog to the nursing home. Vera had a wonderful smile, and I will miss her. to my Great Uncle Carl. I’m saddened to hear about great aunt Vera.She really made me smile.I will miss her dearly.